Yep, it’s the last Sunday of the month again, so time for a breakfast meetup at Trattorie. Quite a good turnout, including two newbies: me, awhina, lytteltonwitch, non-fiction, and mecka-antics. We’ve been trading recipes with mecka-antics via the BCNZ Yahoo list, because he’s just moved to Christchurch and started flatting, so I brought along my copy of The Joy of Cooking for him (which I’d got as a gift from another Bookcrosser, so I was happy to find someone to pass it on to – I was starting to feel guilty that I’d kept it for so long and not got a lot of use out of it). I also passed on The White Dragon by Anne McCaffrey and A Fine Restoration by Kitty Ray, and, as always seems to happen, picked up more books than I released: Lullaby by Chuck Palahniuk, The Perfect Storm by Sebastian Junger, Cosmonaut Keep by Ken MacLeod, and The Best Book of Urban Myths Ever. I would say it’s lucky that I read fast, but since term has started and I’ve started studying again, my leisure reading time has been cut into considerably (especially because I make up the time I spend in lectures by working through lunch, when I’d normally spend an hour reading), so I can see the inroads I was making into my TBR pile being rapidly filled in again if I keep catching so many books. The trouble is, so many of the books released at meetups sound so interesting, and I just can’t bear to miss the chance to read them! 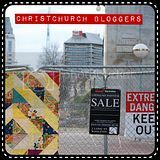 The NZBC Convention made it to the Bookcrossing Newsletter this week – let’s hope it drums up a bit more interest from the locals. If I were ever to organise a convention again (which I’m definitely NOT going to do! ), I’d make sure not to have it on a long weekend. It seemed like such a good idea when we thought of it (being able to stretch the convention over 4 days, and people not having to take time off work), but we didn’t realise how many families have special get-togethers and things over Easter weekend. I’ve had so many emails saying “I’d love to come, but…”. Oh well, good advice to pass on to whoever the organisers are next year. so I’m now officially just over a quarter of the way through it! A few more items for the goody bags have arrived in the last few days, this time donated by Mundoo. They look fantastic, but I won’t say anything more here, because I’m keeping them a surprise for now. Great start to my plan of releasing a book or two at the university every day this week – yesterday morning I was running late so didn’t have time to grab any books as I ran out the door. Still trying to drum up some last minute interest in the NZBC Convention. We’ve had some help from the Bookcrossing Support team though – they’ve put a notice up about the convention on the Bookcrossing site. And some more good news about the convention: Lytteltonwitch has been trying to find a venue for our convention dinner on the Saturday night, and was talking to someone at Christchurch Girls High, to see if we could hire a room there for the night. It turned out that the woman she spoke to had heard of Bookcrossing, and thought it was a great idea, so she’s given us a huge discount on the room hire! The new university year starts today, so it’s a perfect time to release books around the campus, while the students are still excited and enthusiastic and receptive to new ideas. I’m planning on trying to release at least one book a day on campus this week, in the hopes of catching a few new members for Bookcrossing. This morning I released Villette by Charlotte Brontë outside one of the Gender Studies seminar rooms, and A History of the United States: Volume Two: The Growth of the USA by RB Nye and JE Morpurgo in the History building. I don’t know if I’ve got enough suitable books to carry on with the themed releases all week, but I’ll certainly keep releasing something every day. I’m carrying on with my own studies again this year (well, I will be assuming that my enrolment problems get sorted out – I gave up trying to enrol in the official enrolment week, but hopefully I’ll be able to sort everything out and finish enroling this week…) This semester I’m studying Historical Linguistics, which sounds like it’s going to be really interesting. An eternal game of solitaire? Went to Trattorie for lunch with Lytteltonwitch yesterday. Actually, technically it was a meetup for the Cross-stitch meetup group I’m trying to resurrect (I wanted to join a new meetup group,in the hope of expanding my circle of friends outside of Bookcrossing a bit (not that there’s anything wrong with Bookcrossers, I just don’t want my entire life to be dominated by one sphere of interest), and chose cross-stitch as being the most interesting. Only trouble was, it didn’t have an organiser, so had been languishing without any meetups for several months. So I did the obvious, and volunteered my services). Yesterday was the first meetup I’d organised for the group, and Lytteltonwitch had offered to come along because I was worried nobody would turn up, and I’d end up sitting in a cafe by myself looking sad. As it turned out I was right (although I did get an email from one group member thanking me for setting up the meetup, and appologising that she couldn’t make it this month, but would try in the future, so I haven’t given up all hope yet), but Lytteltonwitch and I had a nice meal anyway, and spent the time trying to figure out ways of attracting more New Zealanders to the NZBC Convention, which is now only 5 weeks away, and looking like NZers are going to be outnumbered by the Australians! I also passed The Cat Who Moved a Mountain by Lilian Jackson Braun on to Lytteltonwitch, so I came out pretty even on the books caught/released stakes. Not much more to do on this section, and then I’ll be quarter of the way through it. One of the fun things about planning a convention for such a generous community as Bookcrossers is people offer to send you all sorts of cool things to go in the goody bags. I’ve had emails from all over the world, offering to send everything from books to lollies, plus quite a few mysterious “I’ve got something in mind to send you for the convention” messages. The first package of goodies arrived today – ThanksMom sent us 40 of the patches she’s had made for the US Convention (which is being held in Fort Worth in April). She’s asked us to charge people for the patches, and donate the profits to the Bookcrossing site, which of course we’re more than happy to do, especially as her suggested price was only US$2 (which works out as about NZ$3) – I don’t think anyone will object to paying so little for such high quality patches! In with the patches, she’d included a couple of books: The Crazy World of Cats by Bill Stott and The Two Pound Tram by William Newton. The accompanying note said I could either read them myself or hand them out at the convention – I think I’ll probably try and do both, if I can get them read before Easter (the cat one shouldn’t be a problem at least, because it’s just cartoons). Had an email today to say that someone had just caught Wuthering Heights, one of the books I released at last year’s mini-convention. So that’s another book that’s taken 10 months between release and catch. The finder said they’re going to send it to Austria, so I hope it gets another journal entry when it gets there! We’ve spent vast amounts of money on travel over the last week (quite apart from the trip to Alexandra). First I booked flights for me and TopKat to go to Brisbane in June for the Australian Bookcrossing Convention (though I think the shopping is more of an attraction for TopKat than the Bookcrossing! ), and then MrPloppy booked a flight back to the UK for his brother’s wedding in May. Oh well, there’s our savings almost totally cleaned out, but that was the whole point of keeping a couple of thousand aside in the savings account, just in case MrPloppy had to go back home for anything, and his brother’s wedding seemed an important enough reason to use the money. I just hope he doesn’t need to go back again for a year or two, until we’ve managed to top up the savings again! At least the flights to Brisbane were cheap – Freedomair were doing a 2-for-1 special which meant we got the flights for nearly half price (not *quite* half price, because the taxes etc weren’t included in the 2-for-1 bit, but close enough to save a lot of money!). Anyway, now that the rush is over, I’ll attempt to catch up a bit. Going back to the week before last: Flew down to Dunedin after work on the Wednesday evening (with much amusement at Christchurch Airport at all the rugby fans desperate to get up to Wellington for the big game, and all the monitors flashing “Wellington closed – no flights today” (can you tell I don’t like rugby? )), and was picked up at the Airport by Mum, who drove me up to Alexandra. Chatting as we drove, we got onto the subject of Bookcrossing, and Mum was quite fascinated by the idea. So, as I had a few books in my bag (of course ), we stopped off in Roxburgh, and I released a book at the information centre. I think that’s the first book ever released in Roxburgh, so it’ll be interesting to see if it sparks any interest there. Alexandra was even hotter than usual for this time of year (it hit 40 degrees on all three days I was there – the official temperature was a bit lower, of course, but all the locals trust the temperature displayed on the pharmacy in the centre of town more than the official temperature that gets on the TV news, which is recorded near the river so is always a few degrees cooler than it is in town), so we had a late barbeque dinner sitting in Mum’s garden, which looks more impressive every time I see it. Mum, stepfather, stepsister#1 and I sat there talking (and arguing politics – stepfather and I have diametrically opposed views, so we have some interesting discussions!) until the very small hours of the morning – it was just too hot to go to bed. In the end, I decided not to go back down to Dunedin with Mum and stepfather – I decided I’d already had enough travelling, with another long trip planned for the next day, so I spent the afternoon sitting in the garden reading a good book (A Boy’s Own Story by Edmund White), and trying not to scratch my mosquito bites (Alexandra doesn’t normally have a mosquito problem, but a wet December followed by a hotter than normal January has brought them out in droves – very hungry droves). On the Friday, (after another late night) Mum and I decided we needed a nice relaxing “quality time” day together. So, after signing Mum up on Bookcrossing (she’s now TopKat), releasing White Rose by Amy Ephron to her, and helping her to release one of her own (‘Tis by Frank McCourt), we headed off on a releasing expedition. First stop was the supermarket, where Mum released one of my books for me, leaving it on a display of plants outside the entrance. I stayed in the car and watched it while she did some shopping, so I was able to report back to her afterwards about everyone who had shown an interest. It was still there when we left, but had been picked up and put back down by quite a few people! Next we headed out to Clyde, where we released books at a dairy, outside the Masonic Lodge, and on a picnic table. We went back past the Masonic Lodge a few minutes later, and the book we’d left there was gone already (no sign of a journal entry yet though). The real aim of going to Clyde was to have lunch somewhere nice, so we went to the Old Postoffice (now converted into a very nice restaurant), and sat in their garden. A few empty tables presented a perfect release opportunity, so I put ‘Tis (which I’d originally intended to take back to Christchurch and release at a meetup) down on one, where we could watch it as we ate our lunch. Not long afterwards, an elderly couple came into the garden and sat down at that table. They spotted the book straight away, and we could see that they were discussing it (they were just out of earshot), and carefully reading the “free book” sticker on the front, and the label and bookmark inside. The waitress came over to take their order, and they showed the book to her, and she inspected it too, then called over another waitress, who also carefully read all the labels etc. By this time, Mum and I had finished our lunch, but it was too much fun watching the reaction of everyone to the book, so we stayed at our table chatting and trying not to look like we were watching them. The book was passed back and forth between the couple several more times as they ate their lunch, and eventually they must have decided it really was a free book, because the man left with it under his arm. Success! Even if they never journal it, from the look on his face, that book has gone to a new home where it will definitely be appreciated – which is what Bookcrossing is really all about. We headed back to Mum’s place, and I raided her bookshelves (with her help, of course!) for more unwanted books to take home with me and register, then packed my bags and went to meet Dad, who was giving me a lift back to Christchurch (he and stepmother were going up anyway to watch the Coast to Coast, so dropping me off would only be a wee bit out of their way). We didn’t get away from Alexandra until about 5.30pm, and by the time we’d stopped a few times along the way for food and ice-creams (I was wishing I had brought a few more registered books with me – there were so many perfect release opportunities I missed out on!) it was nearly midnight by the time we finally reached Christchurch and I collapsed into bed. Dad of course spent most of the rest of the weekend doing stuff around our house (despite my insistence that he just have a holiday!) – so we’ve now got a new cistern on the toilet (he started off trying to fix the old one, but ended up going in to town to buy a whole new cistern! ), the roses are pruned, the puncture on my bike has been repaired (I could have done that myself, but he just said “well, while I’m here…”), and we have several sacks of sand sitting in the garage ready for when we lay the brick paving (I did at least manage to restrain him from laying the bricks himself – I think only because it was starting to get dark!). In between all this, he was driving stepsister#2 around looking at houses – he really doesn’t do relaxing well! And of course, MrPloppy and I couldn’t just let him do all this work himself, we had to help, so by the time Dad and stepmother left on Monday morning, we were exhausted – going back to work was like a holiday in comparison! Tuesday night was the monthly meetup – we were expecting new member mecka-antics to come along (not a new member to Bookcrossing, just new to Christchurch – he’s just moved here from the West Coast) to show us his designs for a logo for the NZBC Convention, but he never showed up (he told us later he’d got lost, and turned up at the Dux too late to catch us – I think he probably only missed us by about 15 minutes). But we still had a pretty good turnout – me, lytteltonwitch, BizzieLizzie and her husband and son, and Cathietay and daveytay. I picked up a couple of books – Twisting the Rope by RA MacAvoy and The Forest House by Marion Zimmer Bradley – and passed on quite a few: Between Friends by Kathleen Rowntree, A Boy’s Own Story by Edmund White, The Story of Language by CL Barber, a double-sided book of Nonsense Books by Edward Lear and A Wonder Book by Nathanial Hawthorne, and Son of Black Beauty by Phyllis Briggs. Had a few books arrive by post this week as well, so my TBR pile is fair groaning. On Tuesday I got a parcel from GoryDetails – a RABK of three books, The Horizontal Man by Helen Eustis, Love on a Dark Street by Irwin Shaw, and Death is Relative by Edward Phillips; then on Thursday I got The Cat Who Moved a Mountain by Lillian Jackson Braun from petsnpeople (a trade for The Cat Who Ate Danish Modern by Lillian Jackson Braun and The Cat Who Went to Heaven by Elizabeth Coatsworth (not one of the “Cat Who” series, despite the name)); and yesterday I got The Worst Day of My Life, So Far by MA Harper and an audiobook of Divine Secrets of the Ya-Ya Sisterhood by Rebecca Wells from Brendalc57 (a trade for Drowning Ruth by Christina Schwarz). And I got a couple of notable catches this week. One is very well travelled – Medusa by Hammond Innes was released at the Dux after a meetup in November, and it’s just turned up in a recycling centre in California!!! I’d love to know how it got there! The other is in the “never give up” category – I released The Secret of Operation Brain by Dale Bick Carlson in Winchester in April, and it’s only just been journalled now, ten months later. Just goes to show you, just because you don’t get a journal entry straight away doesn’t mean the book is lost forever.